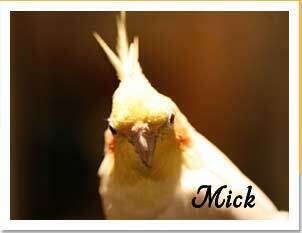 The passing of Mick the cockatiel last October 7 was a personal loss to his longtime companions, Tammy Azzaro and her family. 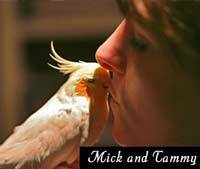 It was also a milestone for Mickaboo - the last connection to its first bird, ironically falling in the 21st year since Tammy’s relationship with the organization’s namesake began. 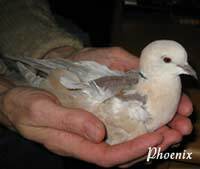 In 1988, when young Tammy Finnigan got a cockatiel for herself and as a companion for the one she had given her boyfriend, Bob Azzaro, she could not foresee her relationship with this small bird leading her to found and nurture one of the largest, most successful and respected bird rescue organizations around. Sometimes the smallest things in life prove to be the ones that change you most profoundly. When people imagine a vacation with their beloved, a Caribbean holiday might come to mind this time of year. Flying across the US to adopt a cockatiel probably would not. 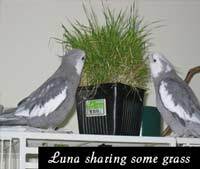 But that is exactly the choice Philippa Money and her fiancé, Frank, made last fall, when they swapped their trip to Aruba for a cross-country flight to adopt Monty the cockatiel from Mickaboo. Well, almost. In truth, they had wanted to visit California for a while, so it was not that great a sacrifice. But they really did abandon the proposed Aruba vacation to fly out and adopt the little bird, going so far as to get special Monty tee-shirts made for the occasion. 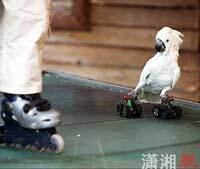 Does your Mickaboo bird do something unusual? 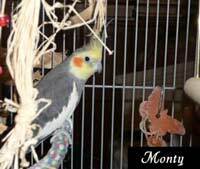 Share your bird's antics with our readers! The bird must be a living current or former Mickaboo foster bird. Pictures and links to online videos are encouraged! The most interesting and endearing entries will be printed in Mickaboo's blog throughout 2010, and a select few will be included in our April 2010 newsletter. Email your story (5 sentences or less) by 3/15/2010.